After nearly a month of a spontaneous vacation from the internets (in which I only checked email and cleared my MT inbox) I'm back! I have a lot of catching up to do, but the break was refreshing. Without further ado, the wall I created during this break! 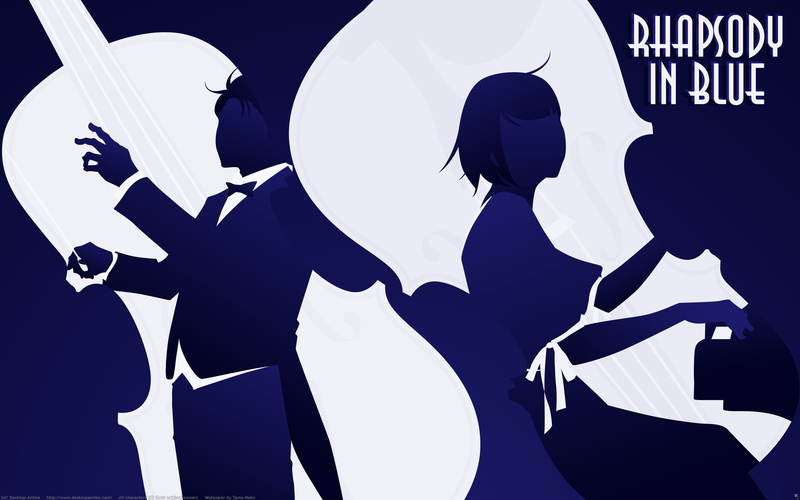 After making a Nodame wallpaper in the Art Nouveau style I figured I should make more Nodame "posters" in other art styles. Art Deco is also a favorite style of mine (I am fond of the curvilinear forms, abstract geometric designs and influence of steampunk) and was an obvious next step. The design of this wall was inspired by two Deco posters I found on an image search; one was from Harper's Bazaar where blue silhouettes of people contrasted against a tilted white skyscraper, the second was an Air France poster with a starry sky contained within a silhouette of a Pegasus. These led to the silhouette+cutout+blue effect of this wall. In keeping with certain types of Art Deco stylings, the character artwork is minimal and uses gradients to define areas instead of outlines, set against another simple trace of a violin (which I found on Stock Exchange). Originally there were horns and flutes and other instruments in the background, but one of the hallmarks of Art Deco is its underlying simplicity, so I eventually cut back all the details. Since the color was blue, what better song to be advertising on this 'poster' than "Rhapsody in Blue"? Gerswhin's piece was written in the mid 1920's, at the same time the Art Deco movement was reaching its height, so it is entirely fitting. this is great style to present Nodame :) You have done really good example of this style! This wallpaper looks amazing with this minimalism of Art Deco and I think you write great comment to this wallie and this style. You're an artist and I can't wait for your next work. Love how the shapes complement each other. You have a great sense of composition, and subtle details are well executed :) . Just not so fond of text on those kind of pieces, but that still goes on my desktop. It's amazing what you did here! Congrats! I loved the Art Deco style, the shades of blue, the design! Awesome! Very modern and impressive! I need to check out Nodame ><! Very classy. The colors look great, and the stark difference between the blues and whites almost forces you to take notice of the smooth, beautiful lines. My favourite part of the wallpaper, though, is the subtle variations in color, especially in the whites. That's awesome. Brilliant wallpaper, Tama. Thanks for letting us take a look. WOW this is the best wall paper i have seen so far. That either means that i have not been browsing long enough, or your wallpaper is really nice. Nice wallie :) Great job! perfect rhapsody in blue. i say so myself.. BRAVO! nodame! hahahaha. sorry. thanks for sharing this great piece.